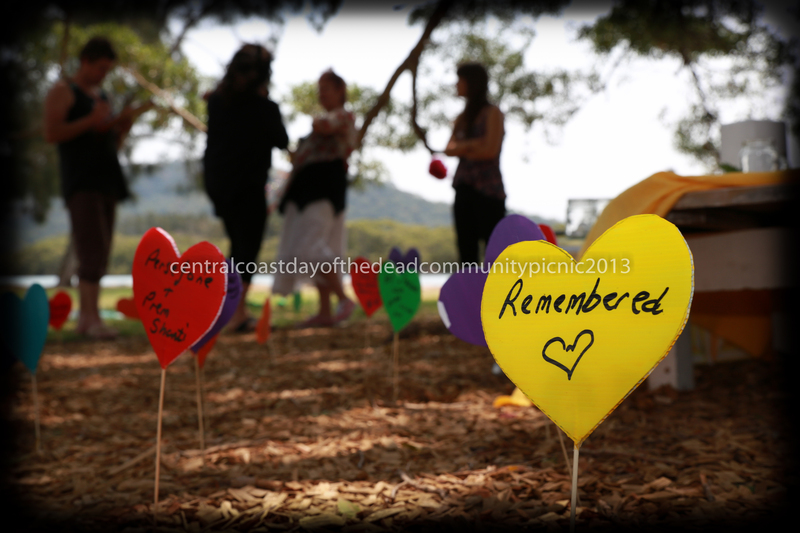 Day of the Dead Community Picnic a SUCCESS! I can safely say that the Central Coast’s inaugural Day of the Dead Community Picnic was a huge success! 35 people gathered, with their special, sacred and precious items that represented their dead Loved Ones, and joined with others beneath the shade of the spectacular Moreton Bay Fig tree, remembering, talking and connecting. Those present for the Remembrance Picnic ranged from 12 months old to 81 years old, and everything in between! We had 2 dogs and 35 in-the-flesh humans….and no doubt scores of attendees “in spirit”. The feedback has been amazing…and as I get to collate the data, I will certainly share far and wide. A total of $440.00 was raised…woooohhoooooooo!!!! That means we can buy the following for Death Cafe Central Coast: A special thanks to all our generous community members and businesses who made donations to the raffle. We couldn’t have done it without you! The left overs might go towards a coffee machine or future publicity materials….we’ll decide over the next few weeks and we’ll let you all know. So thank you to everyone who contributed to the day, either by showing up, helping with setting up or running the day, or doing some behind-the-scenes work. It would not have been such an amazing day without your love, time, support and energy. Bring on Day of the Dead 2014!